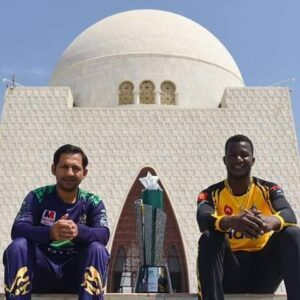 Sarfraz Ahmed and Darren sammy posed with PSL 4 trophy pre finals in Karachi Today. Quetta Gladiators and Peshawar Zalmi captain was snaped today before the PSL final match tomorrow. 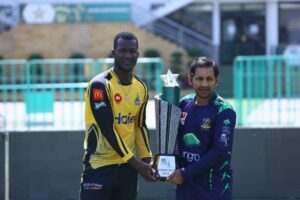 Quetta Gladiators will be taking on Peshawar Zalmi in National Stadium Karachi on 17 March. 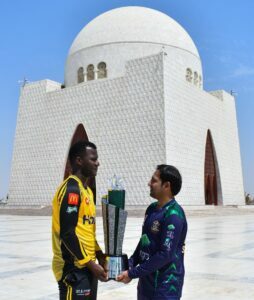 I will not touch that trophy before the PSL final match tomorrow. You can hold it for today and i will take it from you tomorrow. Even PCB is not picking my calls for the PSL final match tickets. 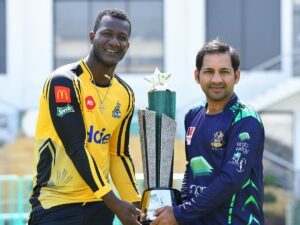 This will be the third time for both sides Quetta Gladiators and Peshawar Zalmi to participate in the PSL final match. National Stadium Karachi will be witnessing a jam packed match. So, we urge our visitors to reach the stadium two hours earlier to avoid any inconvenience.